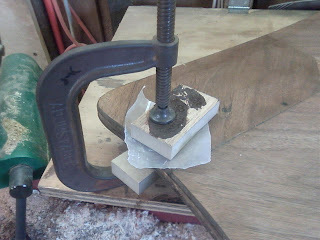 A Challenge! 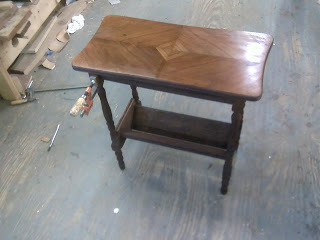 I received an end table made of Poplar with a Walnut book matched veneer top. The table was in pretty rough condition. 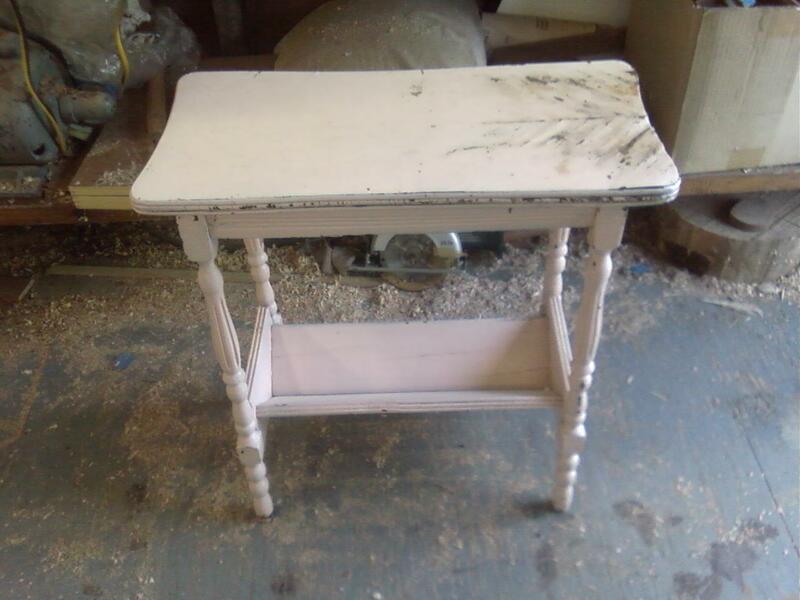 The entire piece had been painted with pink paint and also had been used as a plant stand and as a result, the veneer had buckled from water damage. 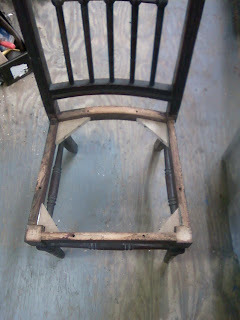 below are some pictures of the repairs and the beginning of the finishing process. 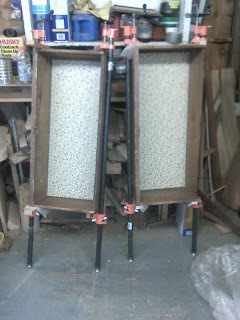 I will post some photos of the completed piece when I am finished. Below is a photo of the table as it came to me. 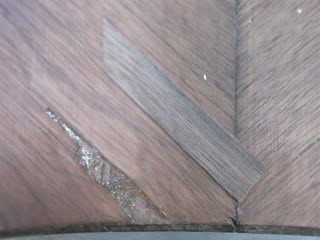 This photo details the water damage to the veneer. I found that the joinery was entirely loose so I decided to dismantle the piece to remove the paint. 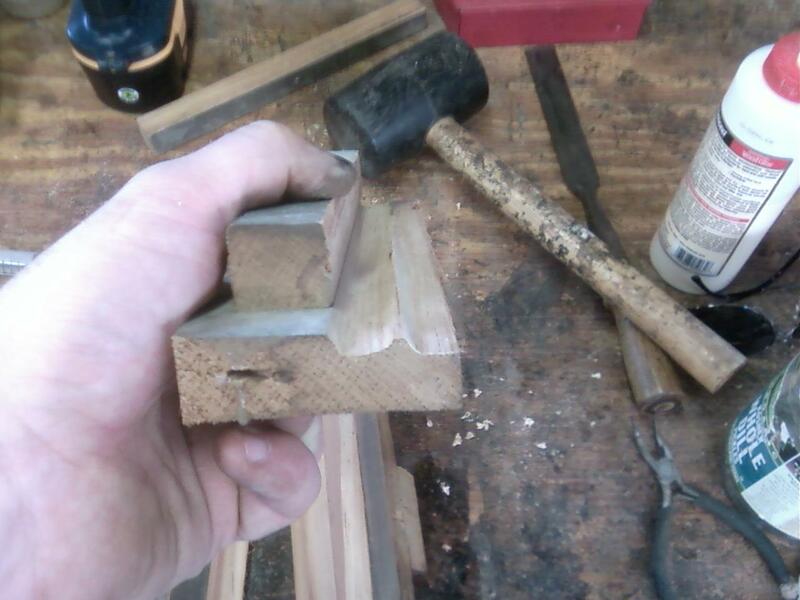 this made the job a little easier. 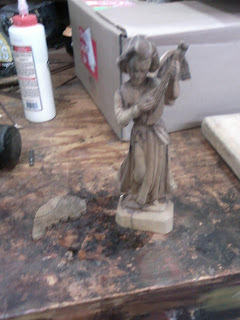 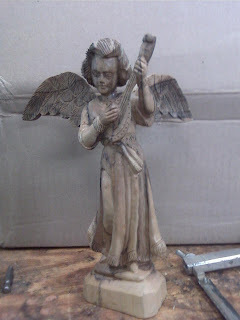 Below is a photo of the individual pieces once the paint was removed. The next two photos show the damage to the table top. Not only had the veneer loosened, but the top, which was made up of different plys, had delaminated. 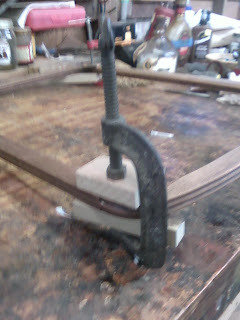 Here is a photo of the top being glued. I chose to glue the veneer and the plys at the same time. 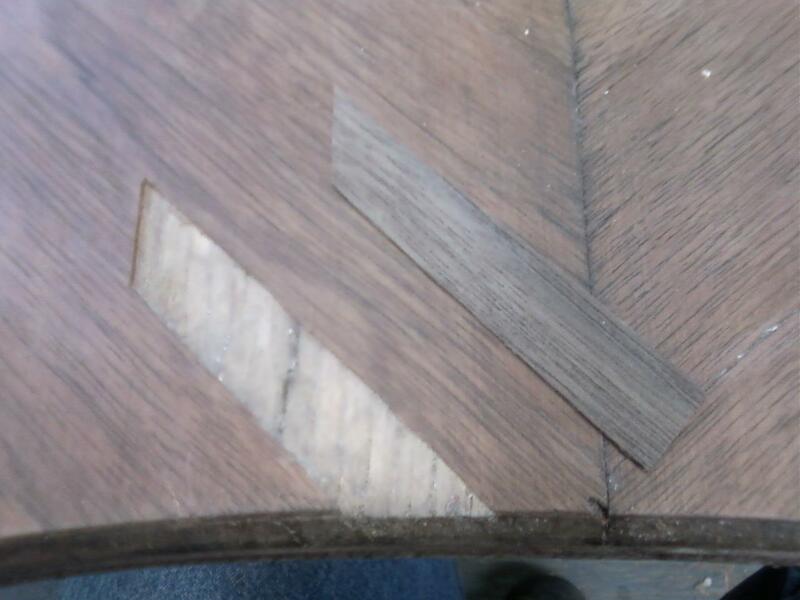 With all of that loose veneer, there was only one place where the veneer was missing. 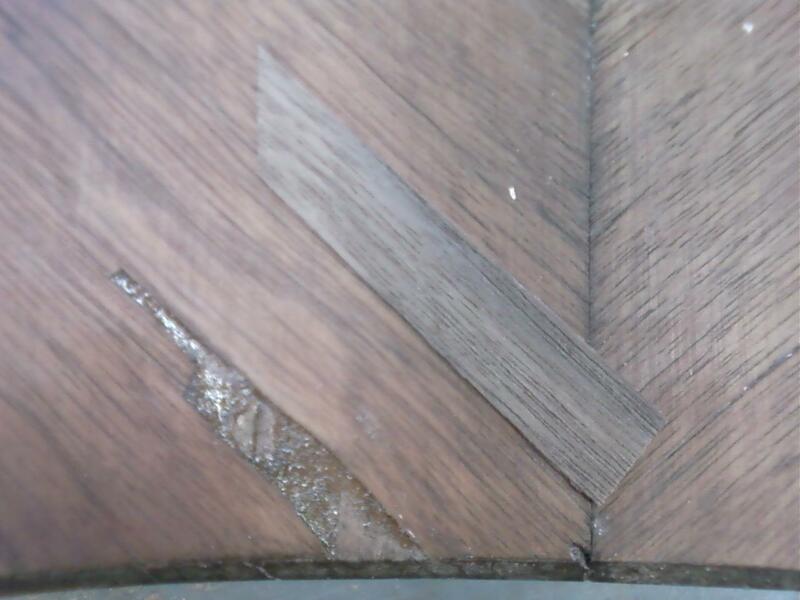 below is are some photos of the veneer patch being cut and glued in place. 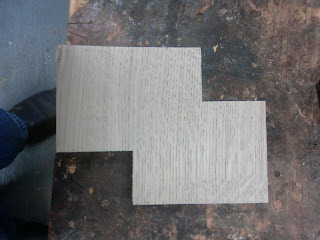 The wood cut out to receive the patch. 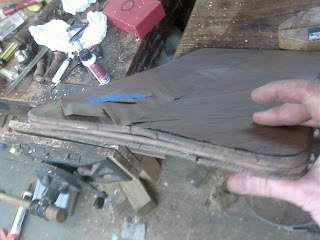 The patch being glued in place. 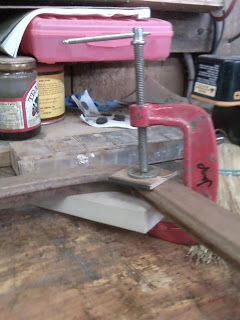 This photo shows the base being glued. This last photo shows the table after the base had been stained. While the stain was drying I decided to coat the top. 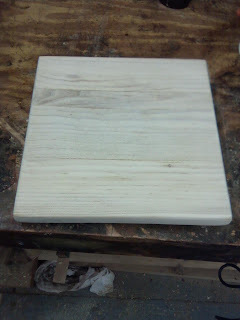 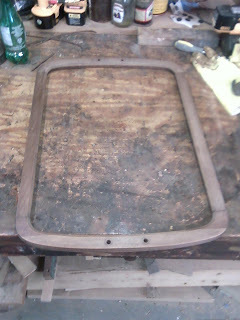 the base will match the top in color once the finish is applied. 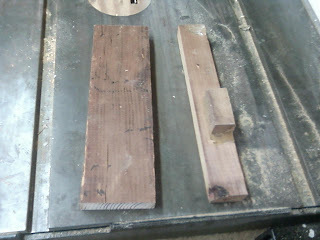 The photos below show the completion of this work. 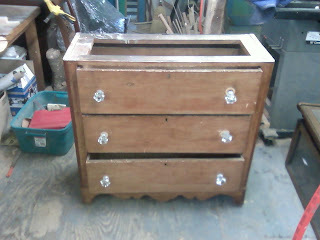 I didn't do anything to the finish so the chest looks more or less the same. 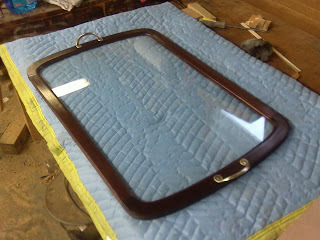 The one thing I did do was to repair gouges that were made to the drawer fronts from the loose glass knobs. 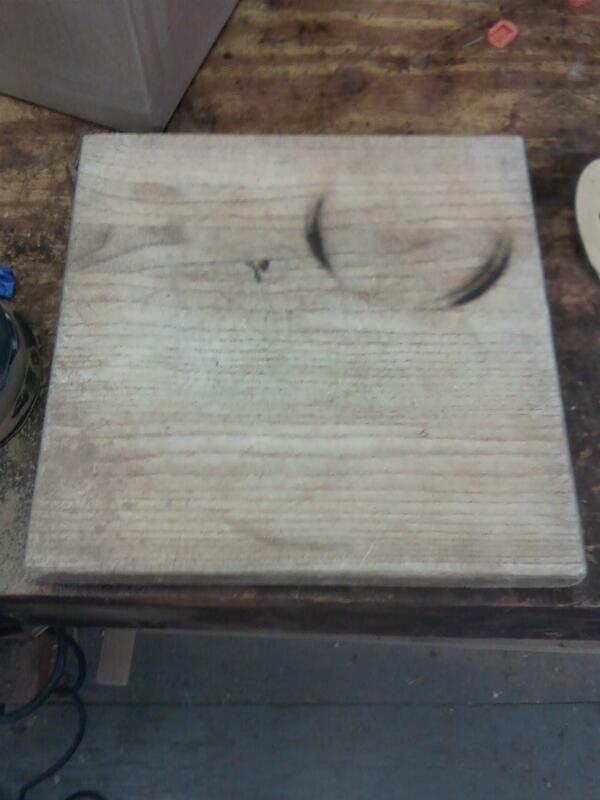 If you look closely at the first picture in the previous post you can see these. The photo of the chest below shows the damage repaired. Two of the three drawers were disassembled to repair the drawer sides. 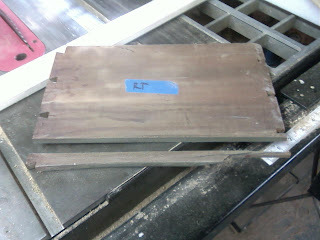 the third drawer I was able to repair without disassembling it. After cutting away the damaged area of the drawer sides I cut new material to glue in its place. 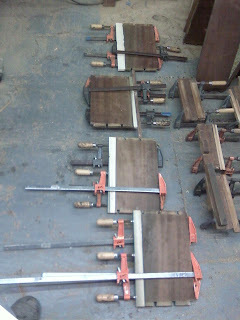 This picture shows the new runners being glued in place on the above drawer. 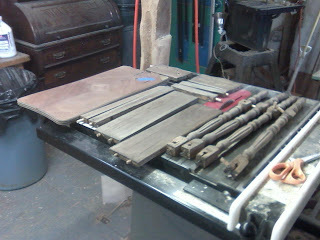 Here are the other two drawers being put back together. 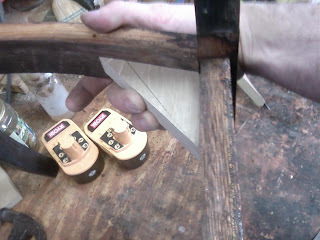 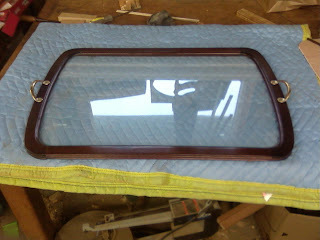 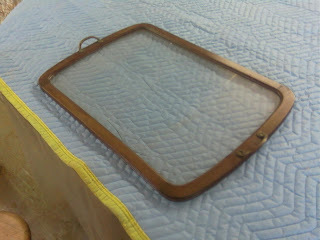 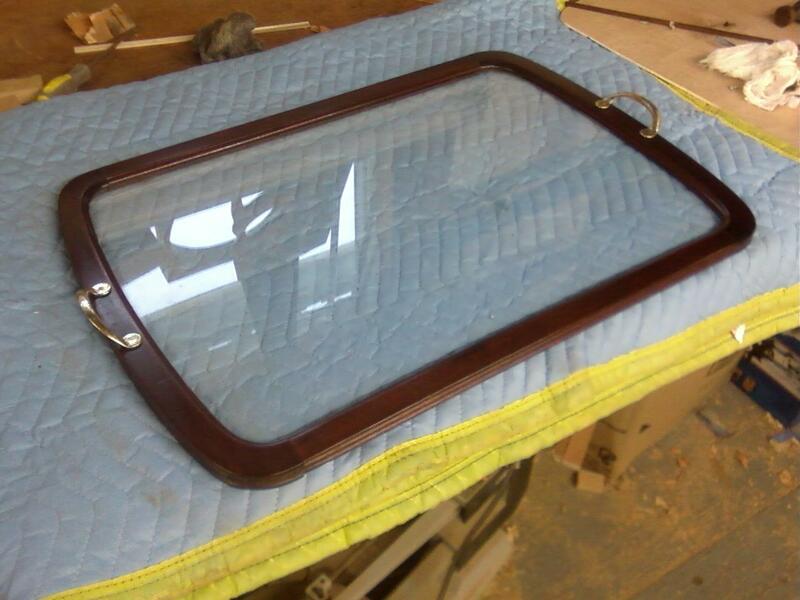 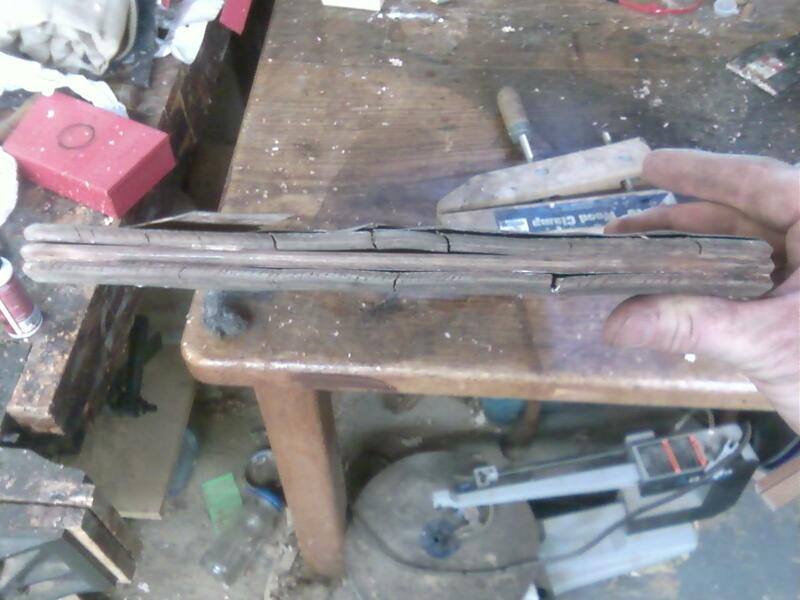 This photo shows the interior runners that were repaired in the previous post being glued in place. 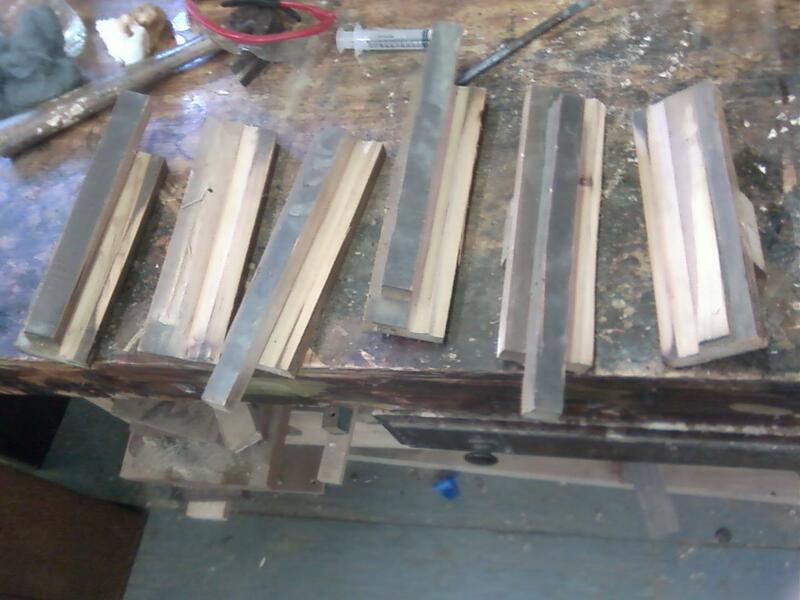 I was going to replace the drawer stops which were broken and worn by contact with the drawer bottoms, but some previous repairman glued new stops on the underside of the drawer dividers. These worked fine, so I removed the old worn stops. 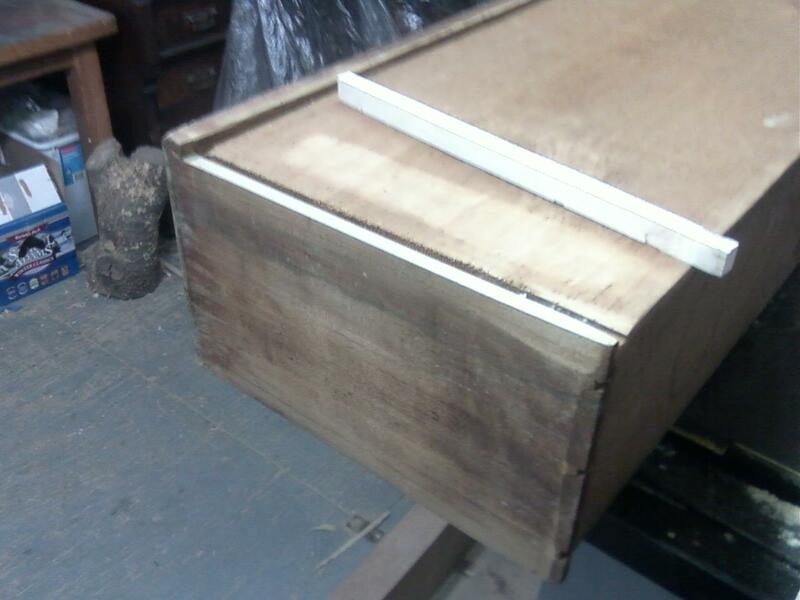 Here is the chest in fine working order. 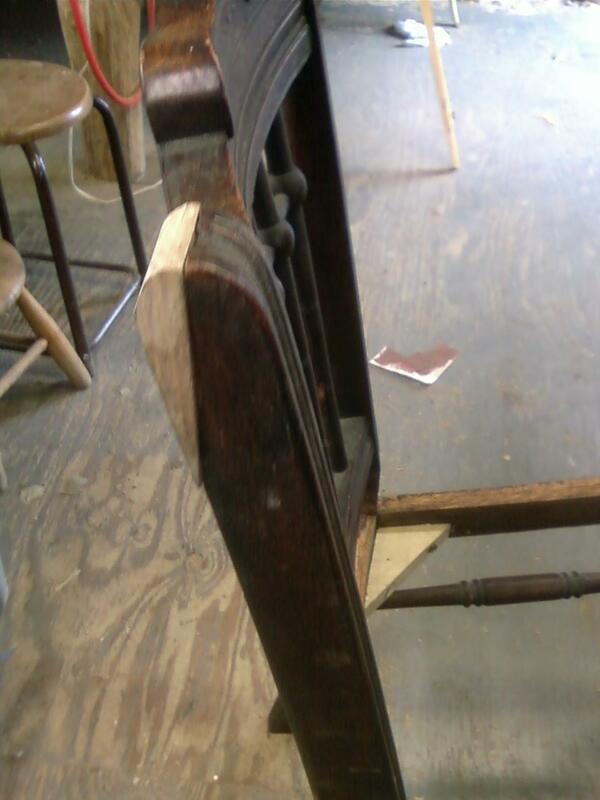 the areas around the knobs have been repaired and the knobs tightened. All of the drawer runners have been waxed with Paraffin wax for smooth operation. 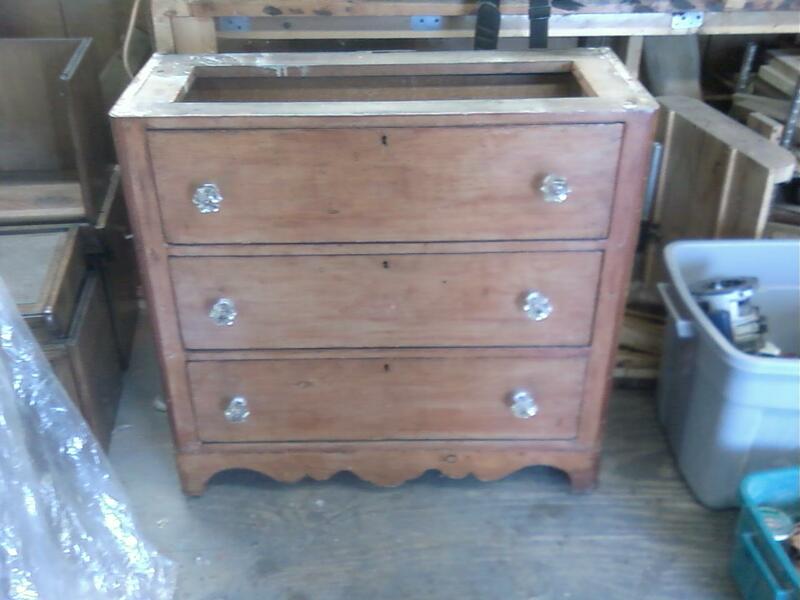 The old pine chest pictured below dates to somewhere between the years 1840-1860. 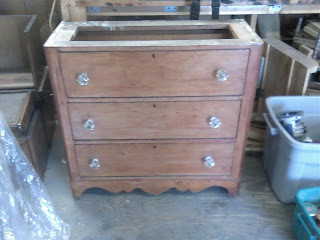 The top of the chest is marble which I left with the customer. The construction is all done by hand and the chest is made almost exclusively of pine. The presence of Poplar as drawer sides and backs indicate that this was a piece built in the south, due to the fact that Poplar grows in abundance south of Pennsylvania. 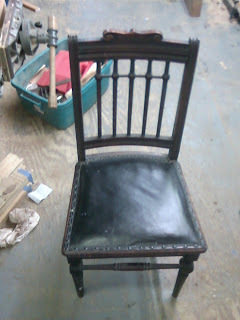 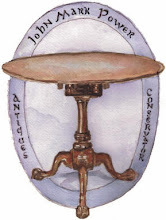 The glass knobs are most likely replacements and the finish is a mixture of old paint and shellac. 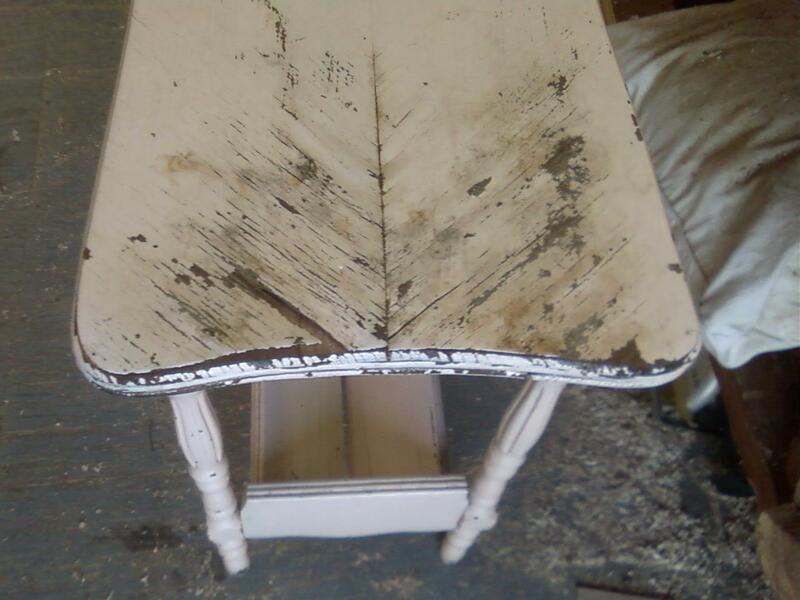 This piece has had several coats of paint on it which have been removed over time. 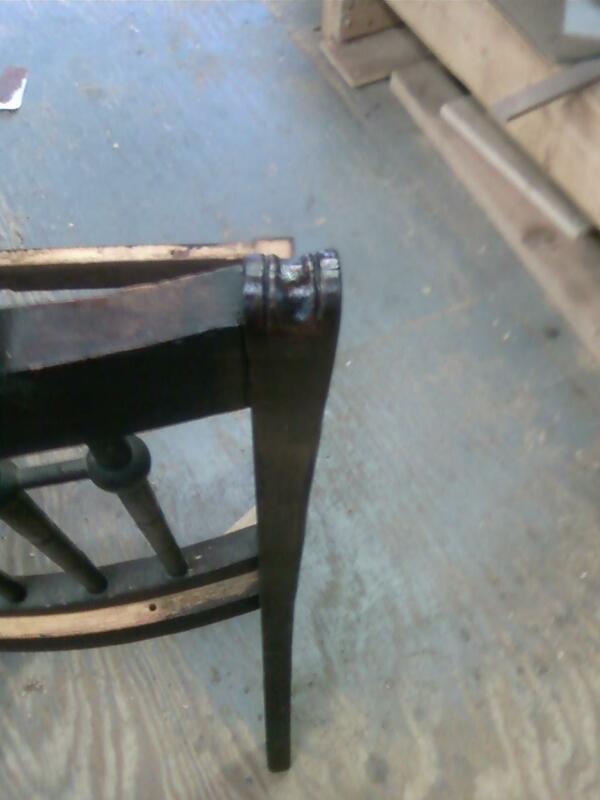 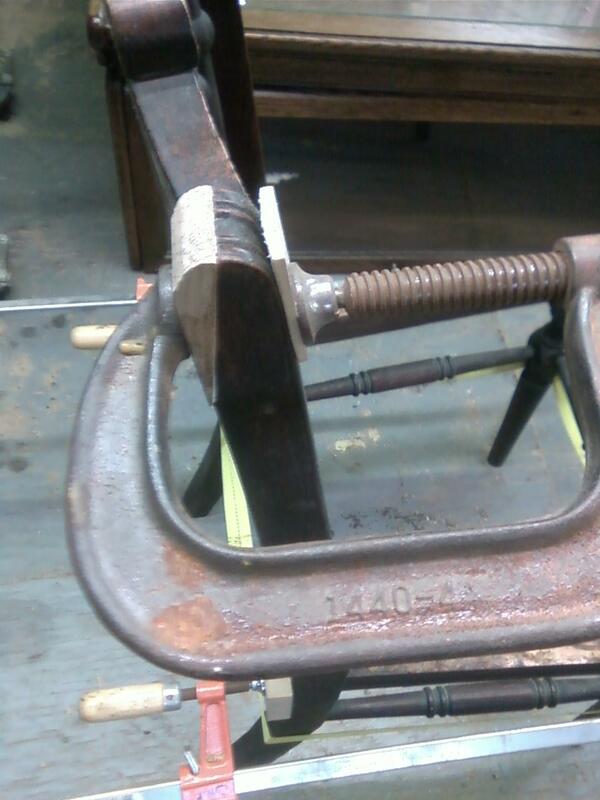 The customer and I decided to leave the finish as is but to repair the abrasion around where the knobs only. The real problem with this piece is that the drawer runner system has become unusable. 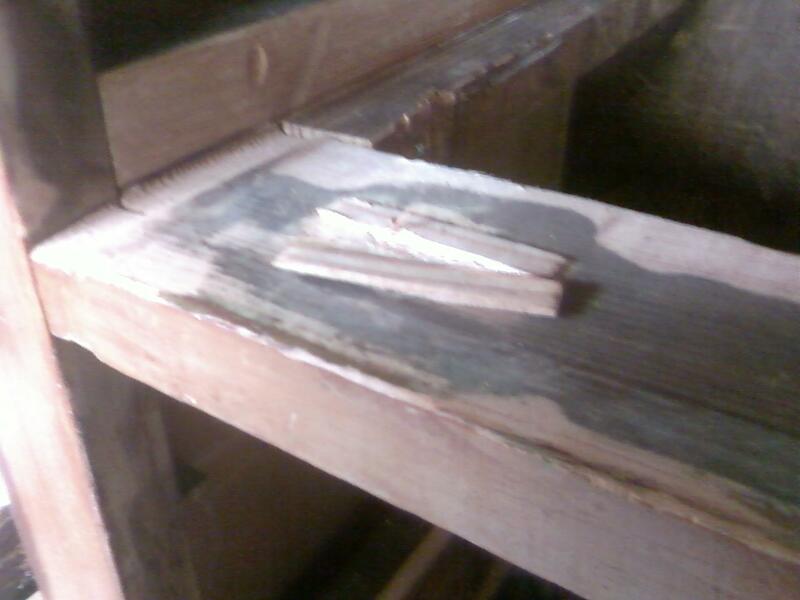 The runners on the sides of the drawers have been worn down and in some cases broken entirely. 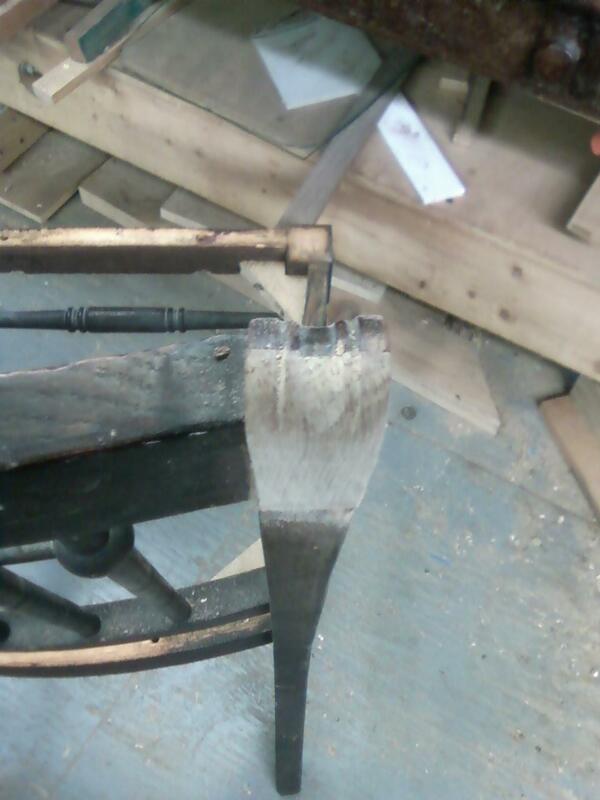 The interior runners have deep gouges where the drawer has had contact and are in some cases incomplete and all were held on solely by the cut nails. 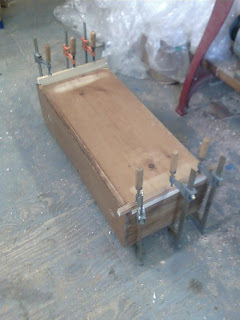 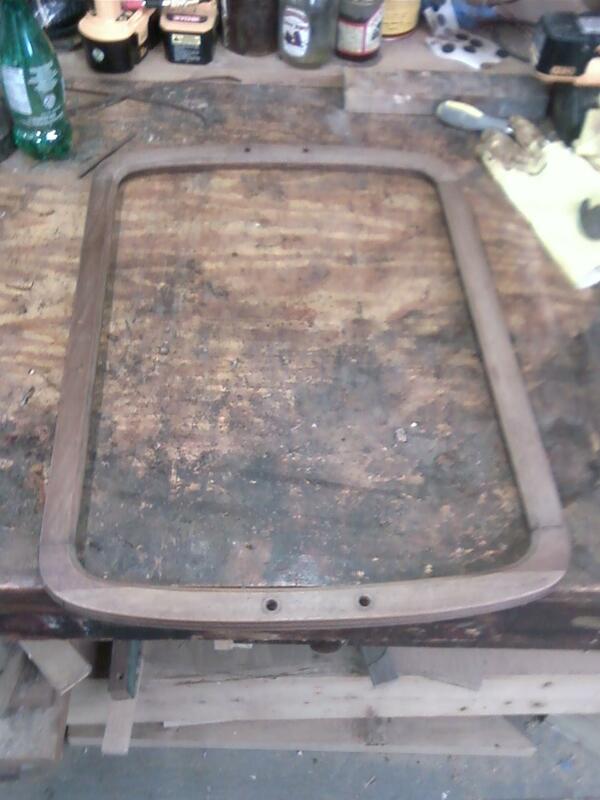 The glue had completely given way.Below is a photo of the chest and following are the repairs to the runner system. 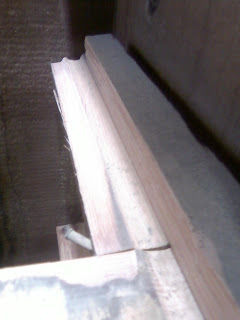 Here is a photo of an interior runner on the right side of the chest. It's job is to support the drawer and guide it into place. If you look at the end of flat board you can see the unevenness. that should be flat. this has been created by years of the drawer sliding in and out on top of the board. 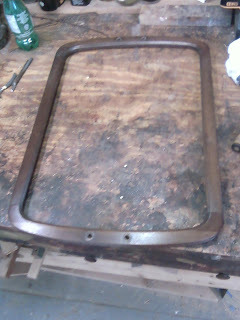 Here is a picture of all of the interior runners removed. 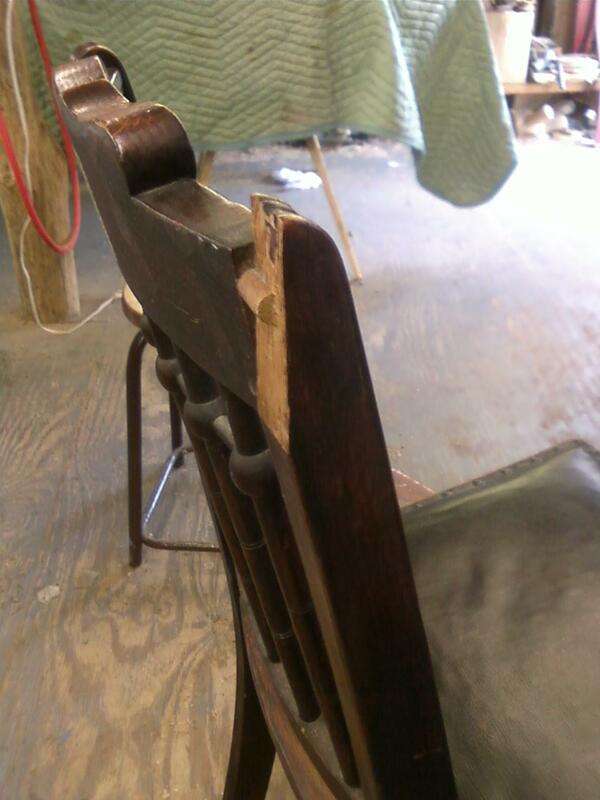 Here is another shot of the damage. 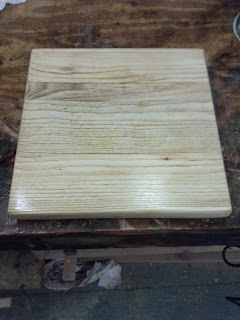 If you look at the right side of the board you can see how much it has been gouged out. 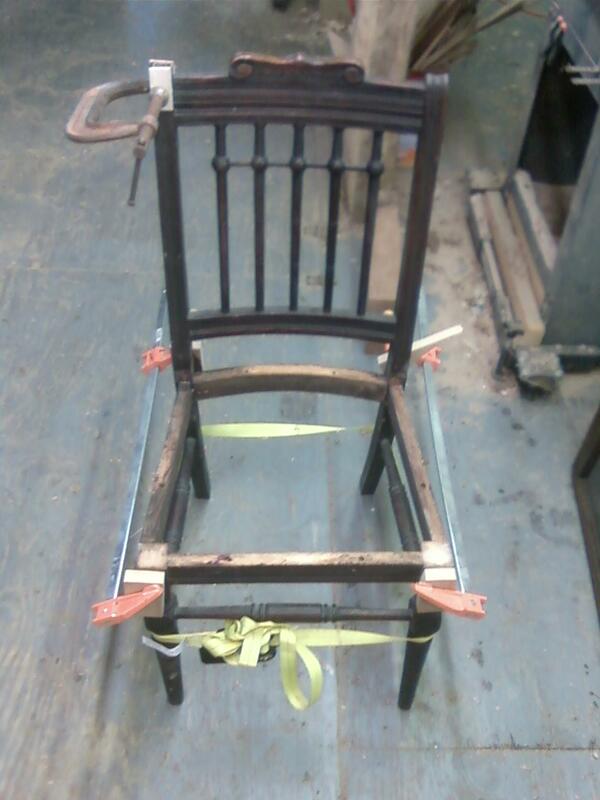 I like to save as much original material as possible in the restoration process. some people would simply discard the old interior runners and build new ones. I chose instead to cut away only the damaged area and to replace it with oxidized pine that is glued in place of the damaged area. Below is a photo of one of the runners with the damaged area removed and the board used for replacement on the left. After I ripped the new board on the table saw the two were joined. 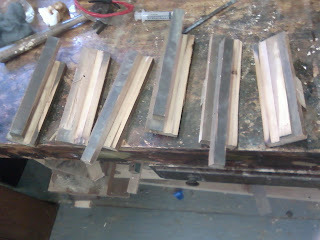 Here they are before joining. 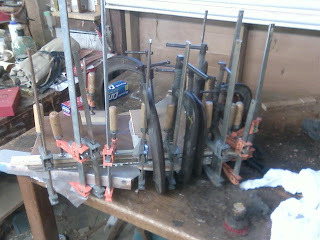 Here is a photo of all six interior runners being repaired. Below are two photos of the sides of the drawers. 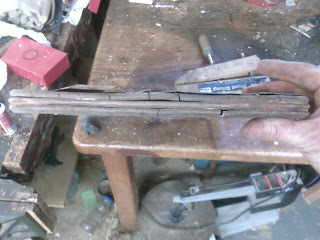 you can see the damage to the lower sections (also called runners). 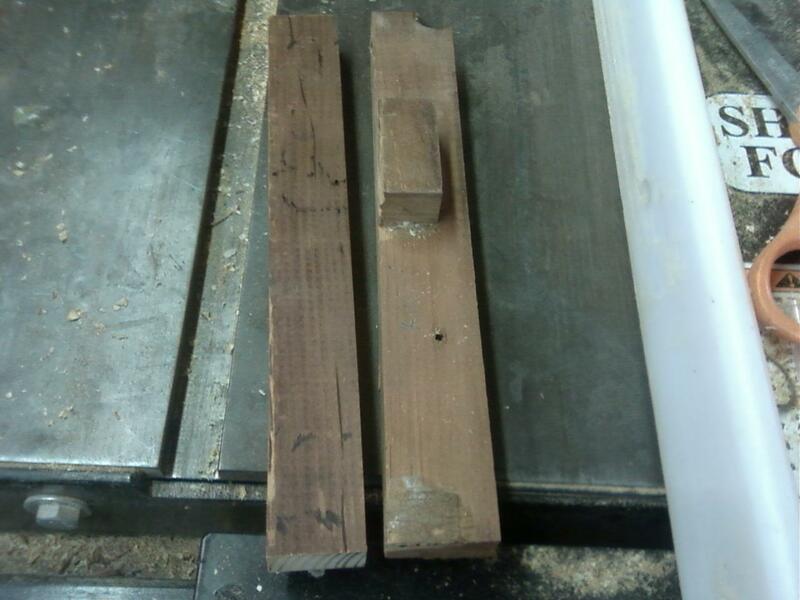 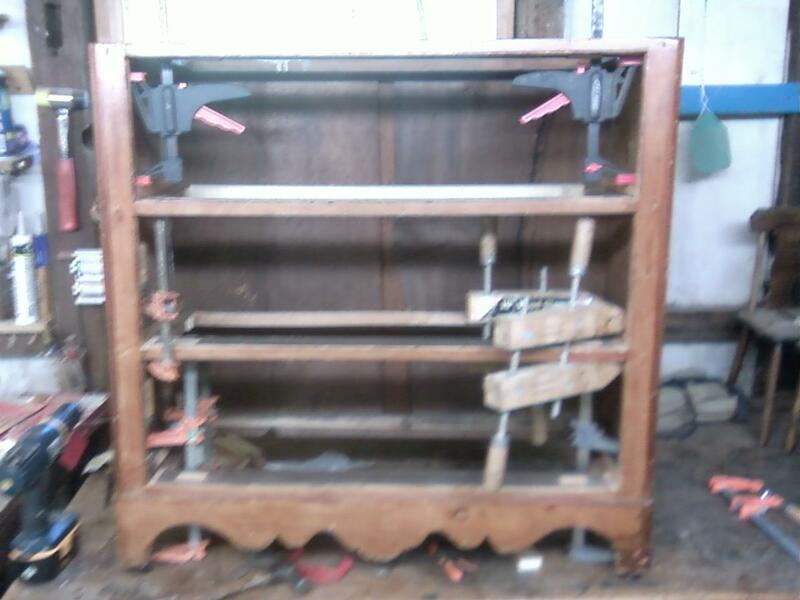 In the first photo, The Runner is broken and in the second there is a section missing. 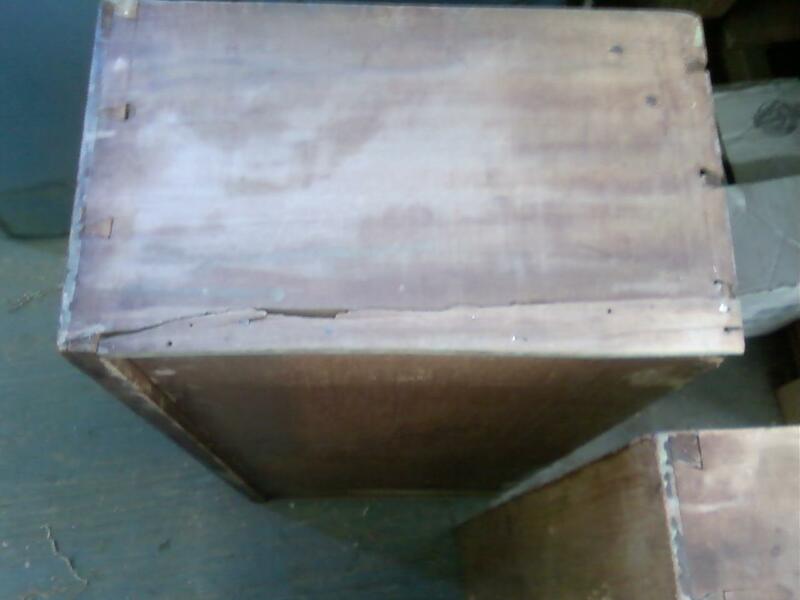 Two of the three drawers needed to be dismantled to properly fix these drawers. 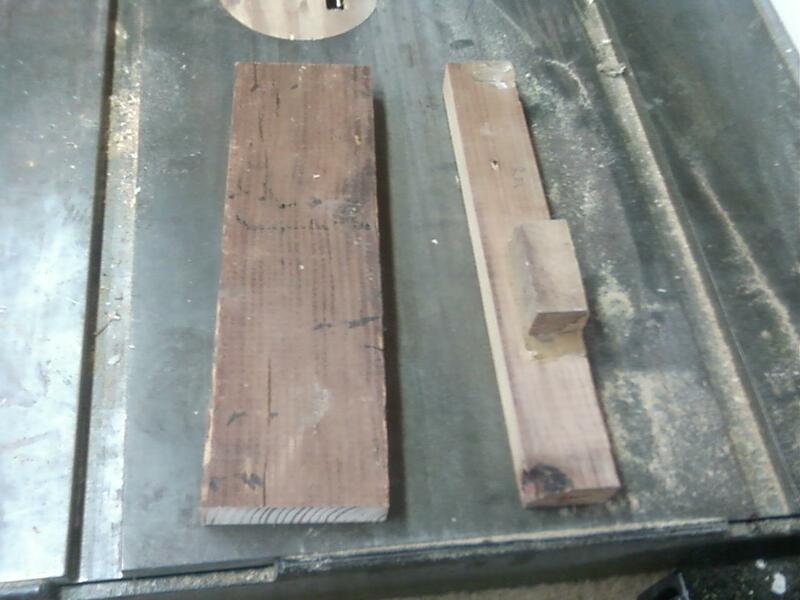 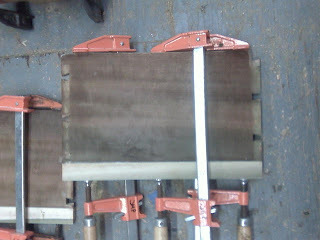 The problem area was removed by ripping the board on the table saw, creating a flat surface to glue the new runner to. 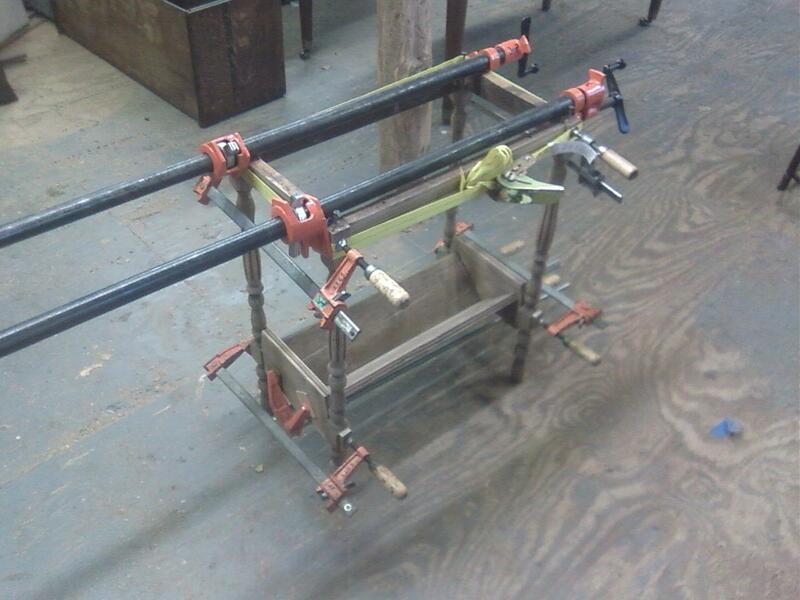 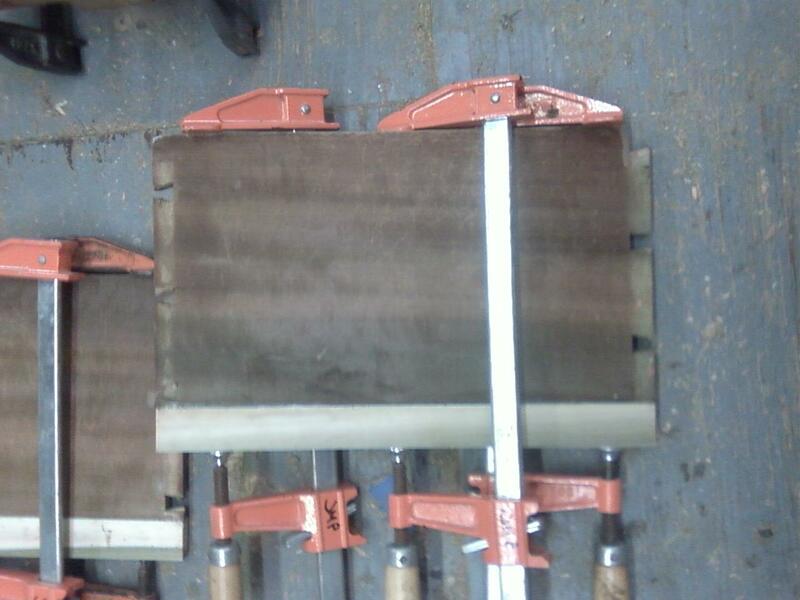 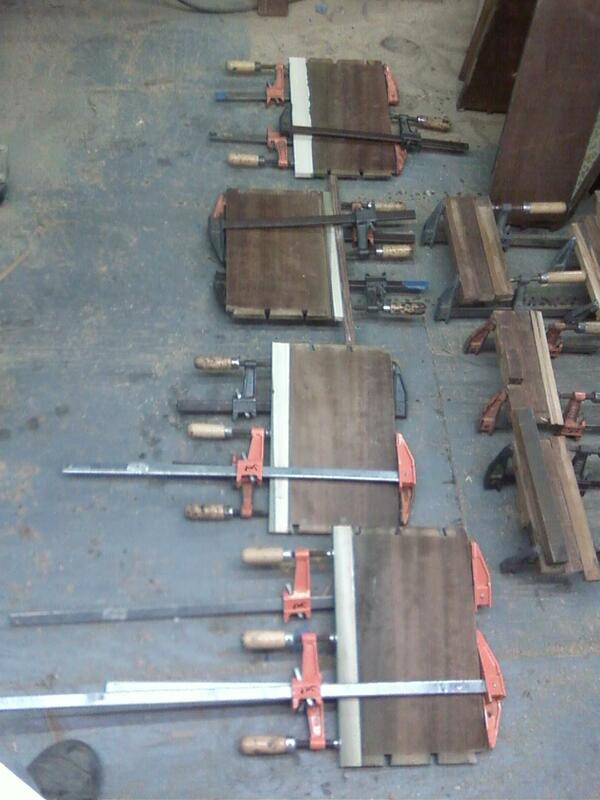 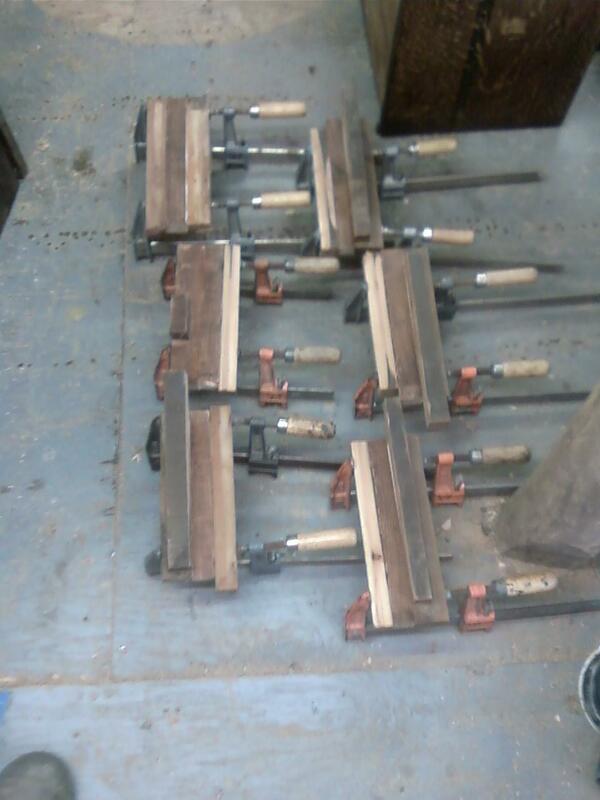 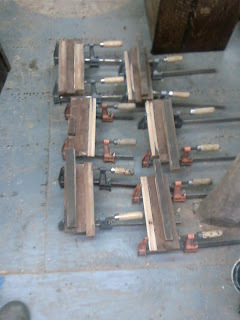 Here are the four drawer sides, each getting new runners attached to the bottoms. 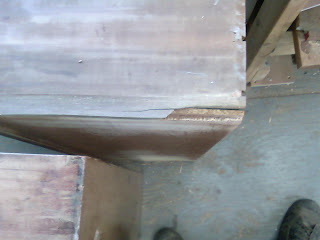 A close up of the installation of a new runner.